All user roles are assigned within the context of a specific tenant. However, some roles in the default tenant can manage system-wide configuration that applies to multiple tenants. Typically a line-of-business administrator, business manager, or IT administrator who is responsible for a tenant. 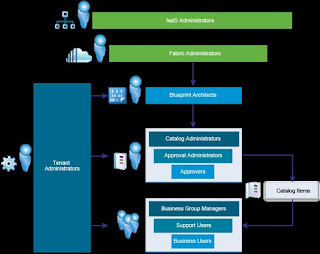 Tenant administrators configure vRealize Automation for the needs of their organizations. They are responsible for user and group management, tenant branding and notifications, and business policies such as approvals and entitlements. They also track resource usage by all users within the tenant and initiate reclamation requests for virtual machines. Manages physical machines and compute resources assigned to their fabric groups and creates and manages the reservations and policies associated with those resources within the scope of their tenant. They also manage property groups, machine prefixes, and the property dictionary that are used across all tenants and business groups. 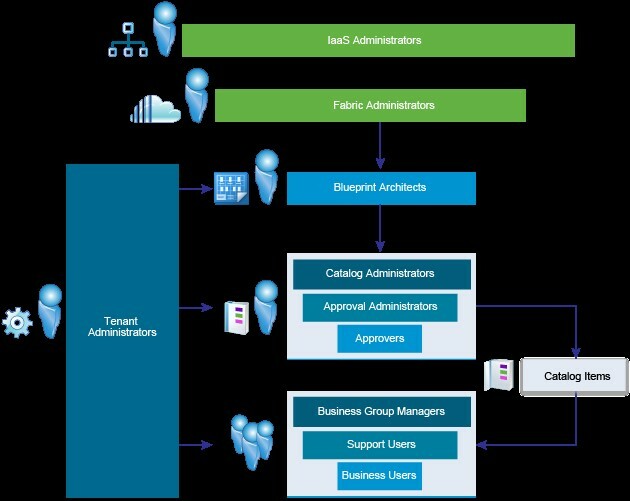 If you add the fabric administrator role to a system-wide role such as IaaS administrator or system administrator, the fabric administrator can create reservations for any tenant, not just their own. Umbrella term for the individuals who are responsible for creating blueprint components and assembling the blueprints that define catalog items for consumers to request from the service catalog. These roles are typically assigned to individuals in the IT department, such as architects or analysts. Creates and manages catalog services and manages the placement of catalog items into services. Defines approval policies. These policies can be applied to catalog requests through entitlements that a tenant administrator or business group manager manage. Any user of vRealize Automation, for example, a line manager, finance manager, or project manager, can be designated as an approver as part of an approval policy. Manages one or more business groups. Typically a line manager or project manager. Business group managers entitlements for their groups in the service catalog. They can request and manage items on behalf of users in their groups. A role in a business group. Support users can request and manage catalog items on behalf of other members of their groups. Any user in the system can be a consumer of IT services. Users can request catalog items from the service catalog and manage their provisioned resources. Any user of vRealize Automation, for example, a line manager, finance manager, or project manager, can be designated as a Health Consumer with read-only privileges for Health Service reports.